Blackbelly sheep of both breeds are able to tolerate heat and exhibit more stamina than most breeds of sheep. They are fleet of foot and in many ways resemble deer. They are “hair sheep,” which means they do not grow wool but have coarse hair instead. If raised in cooler climates, they often develop a wool undercoat that they shed in the spring. 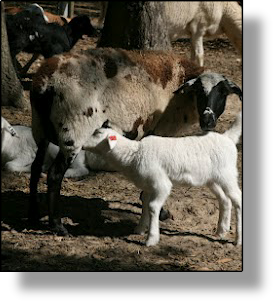 Barbados Blackbelly sheep will breed all year round unlike most domestic sheep. Because they are smaller and slower growing than most wooled sheep, they are not a good choice for commercial production. However, there is a strong market for their lean and mild-flavored meat, and they are popular with herding dog trainers. They are very disease resistant and parasite tolerant, and these genetic traits have created a demand for Blackbelly sheep in crossbreeding operations. They are a perfect choice as a homesteader’s sheep because they do relatively well on poorer forage, can be raised with very little grain, and do not require intensive management. Blackbelly sheep range in color from light tan to a dark mahogany red, with black stripes on the face and black legs, belly, inguinal region, chin, and chest, which gives this herbivore its name. Despite being goat-like in appearance, they are true sheep.